Book reviews, local history, children's resources, and more! Papa Bear can’t wait for the 3rd Thursday in November, when he can feast on turkey with all the trimmings and his favorite treat of all: mixed nuts. But a message in the harvest honeycomb strikes terror in the heart of Mama Bear. 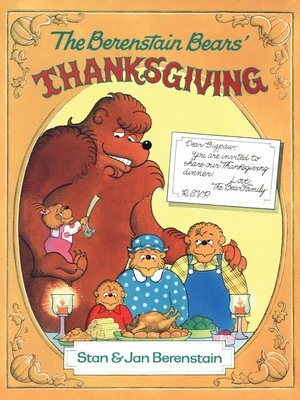 Bigpaw, the legendary Thanksgiving monster, is coming to Bear Country to make sure the bears are remembering to share nature’s great bounty with others. Papa pooh-poohs the legend because, after all, he knows best—no ifs, ands, or buts! Accompanied by Brother and Sister Bear, he travels to the mixed-nut forest to gather his special holiday treat. The animals are quaking in their boots—Bigpaw is already here! Are the cubs in danger? In this delightful, illustrated poem, the Berenstain Bears discover the true gift of sharing. http://e-inc.lib.overdrive.com. Let us know what you think of these selections, and tell us about eBooks you’ve enjoyed – we may feature them here! This entry was posted in eBook Friday and tagged juvenile fiction, juvenile literature, picture book fiction. Bookmark the permalink.